As the popularity of McDonald’s Monopoly grows each year, the more people find ways to try to take advantage of people’s greed or their desperate financial situations. For those who decide to play McDonald’s Monopoly in 2014, it’s important to know and avoid the scams which have developed around the game. While many of these have been around as long as the game has been played, they continue to be relevant today. 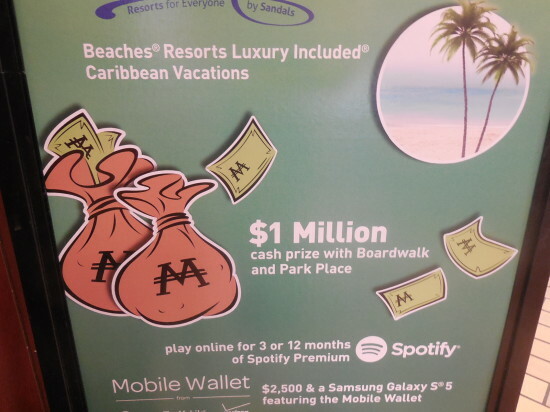 The Boardwalk scam is by far the most common McDonald’s Monopoly scam out there, and it gets its name since it’s usually perpetrated with the rare Boardwalk game piece. Although it most often occurs with Boardwalk, the same scam can take place with any of the rare property pieces. What will happen is someone will announce they have found the rare Boardwalk piece, and they need the Park Place piece to claim the prize. They then ask if anyone with Park Place would be willing to split the the $1 million prize. Since the Park Place piece is common (1 in 11 chance of finding), practically everyone has it, and the person who says he has the Boardwalk piece will be flooded with offers from those willing to split the prize. The big red flag here is that it doesn’t make any sense. The old adage of “if it sounds too good to be true, then it probably is” was written for this scenario. Why would a person who has the rare piece be willing to give up $500,000 when they could find it at McDonald’s by buying less than $50 worth of food to get it on their own? Those perpetrating the fraud know if you are willing to believe something like this is actually available, there’s a good chance they will be able to scam you out of some of your hard earned money. Once you contact them, they will begin to play on your greed or dire financial situation because they know that’s exactly what has brought you this far. Instead of splitting the prize, they will ask if you would be willing to buy the rare piece from them and claim the prize all to yourself. All they will ask is to be paid a small amount for the piece. If you ask why they would be willing to do this, they will come up with a story like they are going to through a divorce and they don’t want their spouse to get hold of it which would happen if they claimed the prize, or they are having IRS problems and need to keep the money hidden for this reason. Once an excuse is given as to why the scammer needs to sell the piece rather than claim the prize, he’ll ask for a relatively small amount compared to the rare piece’s worth. For example, the fraudster may ask for $5000 to $10,000 for the Boardwalk piece. All you need to do is send the money, he’ll send you the piece and you’ll win $1 million. The only problem with this plan is that once you send the money, you’ll never get the piece and your money will disappear. In the past there have even been some fraudsters who have generated fake rare game piece photos to show people to convince them they really have the winning game piece. The truth is that anyone claiming to have any of the rare McDonald’s Monopoly game pieces and is of need of a common piece to finish the property color is a liar. Anyone making this claim is trying to scam you in some way or another. Don’t let your greed or current financial situation get the better of you because the only one who is going to make money in these types of transactions are the ones who are perpetuating the scam. People love the McDonald’s Monopoly game with most hoping they may get lucky and win $1 million. The truth is you have better odds of winning the Powerball Lottery than you do of finding the Boardwalk game piece. In fact, chances are nobody will win the $1 million prize. While many assume someone will walk away with $1 million by the end of the game each year, McDonald’s only gives out the prize every few years, because in order for somebody to claim the prize, a lot of things have to take place which often don’t. That’s exactly why McDonald’s didn’t give away $1 million last year as part of their McDonald’s Monopoly game, and chances are they won’t give out $1 million this year as well. Here are the reasons why it’s so unlikely to happen. McDonald’s creates millions of game pieces and places them on the packaging of different food items. What many people don’t realize is they have to estimate how many food items they will sell, and they don’t want to create too few so they run out of pieces before the end of the game period, so they make too many. While most game pieces are given out to customers, many aren’t, and if the Boardwalk piece happens to be among those which are never given out, then nobody can win the $1 million. Once a piece makes it to a McDonald’s store, that doesn’t mean it will actually make it to a customer. The policy at most McDonald’s is that if packaging falls and hits the ground, it gets thrown away. Again, if this happens to the packaging which holds the Boardwalk piece, nobody can win the grand prize. The next thing that has to happen is the customer who receives the Boardwalk game piece has to actually open it up and find it. There are many people who don’t even bother to look at the game pieces on their food packaging. In fact, it’s such a problem that McDonald’s puts signs on their trash cans (see photo at the top of this article) during the game each year to remind customers not to throw away their game pieces. There’s a good chance the person who does receive the winning game piece may throw it away without ever looking at it. Even if the person opens the piece, they have to recognize Boardwalk is a rare game piece. The vast majority of people who play the game simply open up the game pieces hoping to win a free instant prize and don’t bother with any of the property pieces. 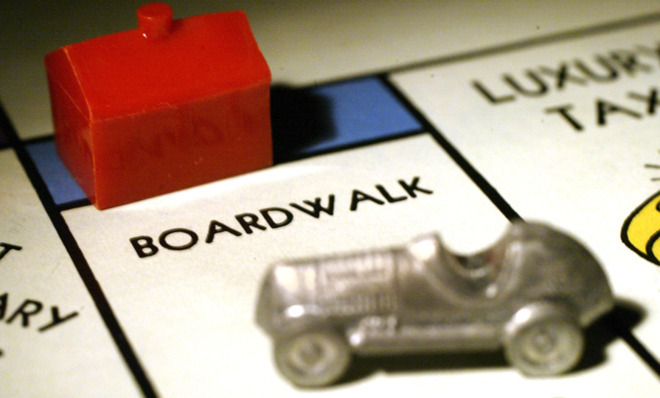 If they don’t know that Boardwalk is the rare game piece they need to win, many will simply throw it away. dIn order to win the $1 million, the person who gets Boardwalk also needs to get Park Place. While this isn’t difficult to do if the person knows they have the rare piece, it may be more difficult if they don’t know it’s rare. Maybe they only visit McDonald’s once a month or rarely, and may never get the other piece needed because they don’t go to but the food there often enough. The Boardwalk piece itself doesn’t win the prize. In the end, all these factors combined means that most years, McDonald’s doesn’t actually have to give the $1 million prize away. Not only is the piece rare, but a lot of other things need to align correctly for the prize to actually be claimed. 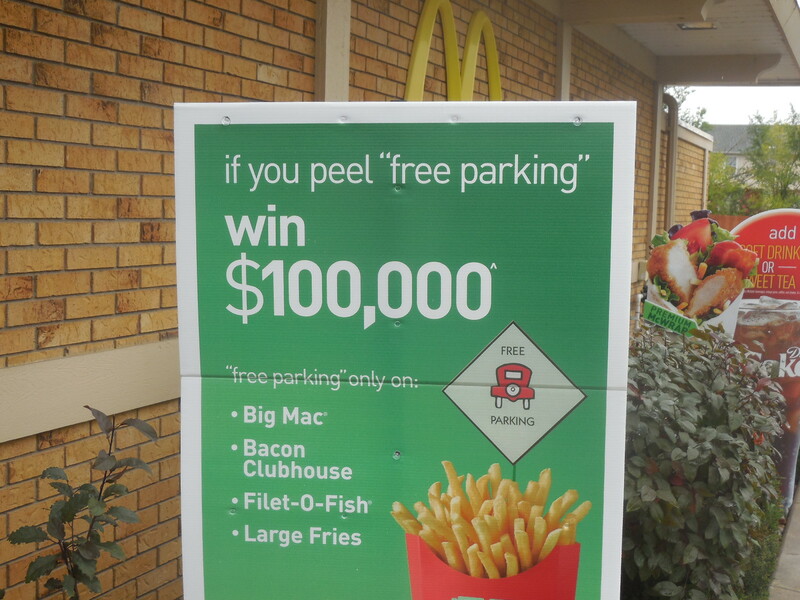 The fact is that in all likelihood, nobody is going to walk away with $1 million from the McDonald’s Monopoly game. For more on Mcdonald’s Monopoly game as well as other Monopoly Games check out these articles. There are a lot of articles about the best way to play McDonald’s Monopoly, but there aren’t many that tell you how you should absolutely not play the game. There are far too many people who don’t know how to play the game correctly, and not knowing ends up costing them money they should have never wasted. There are a lot of people who like to collect all the common game pieces so that if they happen to find a rare piece, they will have the properties they need to win that particular prize. In order to do this, they are often willing to buy the game pieces off of sites like eBay or Craigslist. Doing this is a complete waste of money, and there is no reason to ever buy property pieces unless you already have the rare piece. Until you have the rare piece in hand, your chances are so minimal of actually winning the prize that it just doesn’t make sense to spend money getting the other property pieces. Once you have the rare piece, however, then it makes sense to get the common pieces to fill in the property monopoly. Since the common pieces are so much more common than the rare pieces, it should be easy to do no matter how late in the game it might be. 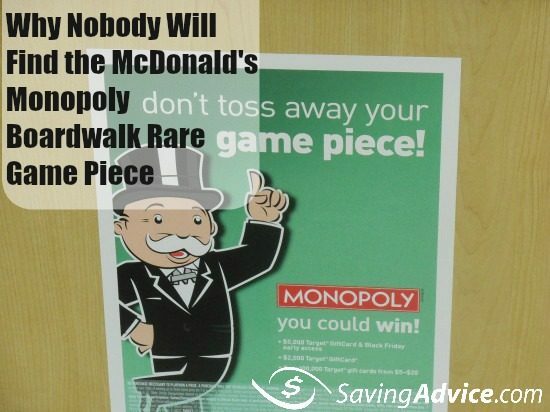 There are a number of people who make some decent side income each year when the McDonald’s Monopoly game is played. One of the ways they do this is by selling the common pieces of the game board to those who want to fill theirs in. While this example isn’t typical, it is a true interaction which took place, and a perfect example of how you don’t want to play McDonald’s Monopoly. The seller listed the 3 common railroad game pieces for auction on eBay. This happened to be early in the game, and there were a few people who bid on the pieces. The three piece set ended up selling for $8, much more than anyone should have paid for them. The bad strategy didn’t end there. The buyer wanted to know if the seller had any more sets of the three common railroads. The seller did and ended up selling 2 additional sets to the buyer for $5 each. In this case, the buyer spent $18 on worthless pieces just in case he happened to find multiples of the rare railroad game piece. If you’re going to play this game, it’s important to not worry about any of the common pieces until after you have a rare piece in hand. Spending anything on common pieces before this is simply wasting your money. While you should keep any common pieces you get from food you buy (and input the online codes), don’t get caught up in the hype of trying to fill in your board with other common pieces until those pieces are necessary. While many people focus on trying to get the rare game pieces to score the big prizes offered as part of the McDonald’s Monopoly game, there are also a lot of instant win prizes available. 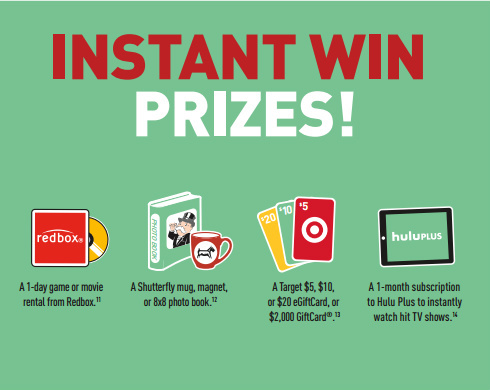 In fact, with all the instant win prizes, your chance of winning something when playing the game is just over 1 in 4. For those who really take the game seriously, you can start preparing for it even though the game doesn’t officially begin until September 30. 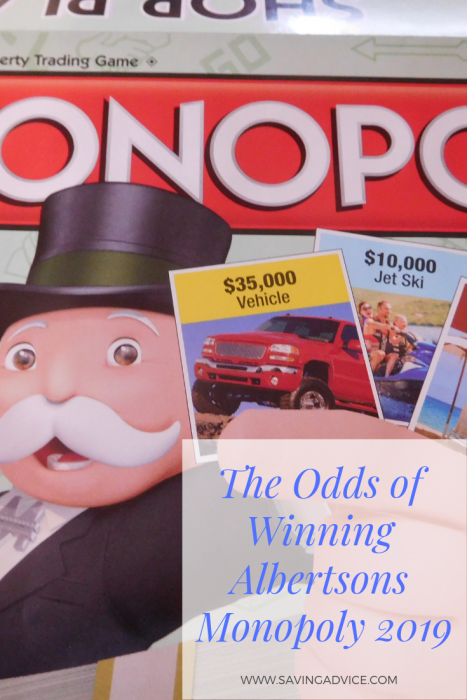 While the odds of winning a big instant win prize is remote, if you’re going to go for it, there is a strange quirk in the odds of one of the big prize items. The odds of winning $100,000 is greatly increased if you buy Bacon Clubhouse sandwiches rather than Big Macs when you go to McDonald’s. In fact, you have more than a 7 times better chance to win the $100,000 from buying Bacon Clubhouse sandwiches rather than purchasing Big Macs. The reason is simply because McDonald’s sells a lot more Big Macs than it does Bacon Clubhouse sandwiches. Since they sell so many more Big Macs compared to Bacon Clubhouse sandwiches, it increase the odds of winning from 19,585,000 to 1 to 150,254,000 to 1. In fact, you have a better chance of winning $100,000 buying Bacon Clubhouse sandwiches (1 in 19,585,000) than you do one of the twenty $2,000 Target GiftCard Shopping Experience (1 in 28,916,633).